by Kennedy, Mary Lynch; Kennedy, William J. This rhetoric/anthology instructs college students in how to read academic texts with understanding and how to use them as sources for papers in a variety of disciplines. 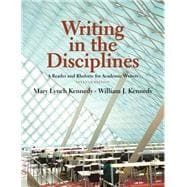 In Writing in the Disciplines,Mary Kennedy and William Kennedy emphasize academic writing as ongoing conversations in multiple genres, and do so in the context of WPA Outcomes. The rhetoric chapters teach critical reading, paraphrasing, summarizing, quoting, writing process, synthesizing, analyzing, researching, and developing arguments. The anthology balances journal articles with works by public intellectuals in the sciences, social sciences, and humanities. Chapter 9: Who Owns Your Body?